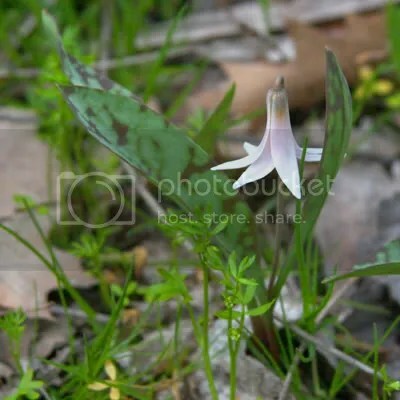 Let’s Paint the White Trout Lily! 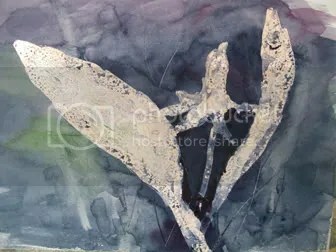 – Let's Paint Nature! Happy Mother’s Day to all you mothers out there. 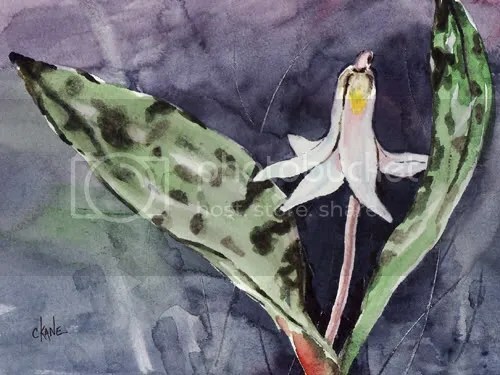 For your present, I am going to show you how to paint a white trout lily! Here we go…. First I’ll show you my reference photo that I took in the Palos Woods, part of Cook County’s Forest Preserve District, a few weeks ago. How delicate and soft this little spring wildflower is! Why do we have spring wildflowers that disappear so quickly? They disappear quickly because they grow when the tree’s leaves have not fully developed yet. Think about it….there is a lot of sunlight on the forest floor before those leaves grow. When the leaves do grow, they block out the sun and prevent many flowers from growing. That’s why it’s sooo important to get out there and hike in the spring, every weekend, to see the lovely ephemeral flowers that fade so fast! 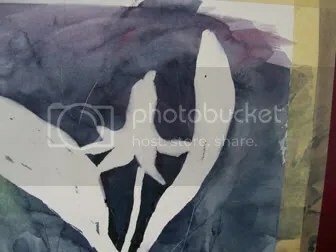 Well, we are going to paint the white trout lily in watercolors so that when it does disappear we won’t have to wait until next year to see it again! 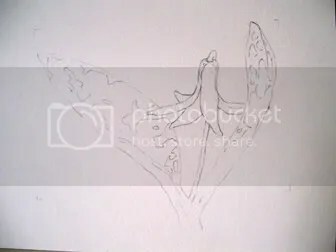 Step 1:Draw a quick sketch of the lily on watercolor paper. I use 140lb cold-press watercolor paper because I use a lot of water and lighter papers won’t hold up. I pretty much like the reference photo how it is, so that’s exactly how I sketched it. Step 2: Because the lily is white, I want my background to be really dark. 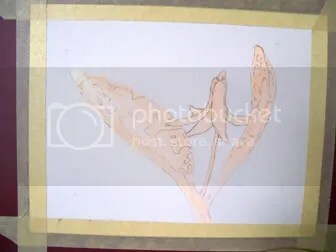 I decided to work on the background first, therefore I had to protect the flower and leaves with masking fluid. 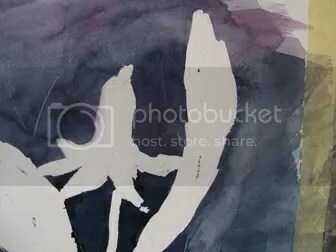 When using masking fluid here is a trick…wet your brush, dip it into the masking fluid, paint your masked out subject while counting to 10, clean your brush, repeat. Clean your brush every 10 seconds. Masking fluid will destroy your brushes fast!!! Make sure you keep cleaning your brush and you will be fine. Step 3: Make a dark wash for the background (indigo blue, crimson, a little sap green). Because watercolors dry light, you will need a few layers of dark paint. 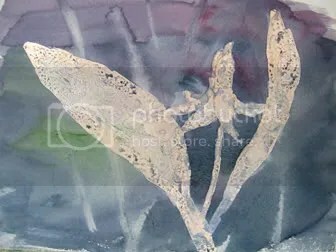 While the background was wet, I took the side of a paper towel and pulled paint to suggest grasses in the back. Step 4: The background is not dark enough for me so after the last step dried, I added indigo blue around the flower and stem. Step 5a: OH NO! LOOK! After the background dried I lifted up the masking fluid and found jagged edges! The leaf nor the petals have jagged edges! Is the painting ruined? Should I throw it out and decide never to paint again? OH COURSE NOT! No worries, here is how you fix that…. Step 6: Next I worked on the leaves. I first painted the leaf a basic light green. While barely wet, I added darker green/brown spots. Remember to leave white space for breathing room. A touch of red/brown is needed for the stem. Step 7 Final: Next I painted the flower. Remember white is never just white. It is a little light blue, or maybe a little light pint. Even snow has color to it! This beautiful white flower had pink, blue, yellow and green! Click here to purchaseit will take you to my “watercolors for sale” site. You do not need paypal to purchase, you can use a credit card. 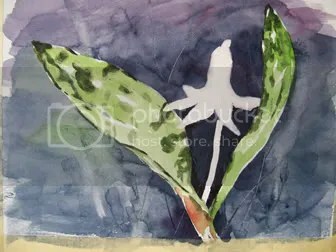 I hope you enjoyed this watercolor step by step of the spring wildflower, white trout lily! I am not painting ..not yet anyway…but i find the process fascinating! Our Trout Lilies or Dog Tooth Violets, as we call them, are yellow. I have never seen a white one. I wonder if it is a western sub-species. Nice painting! Came here from Nature Sketchers blog. You have a wonderful site. Your paintings and sketches are beautiful. Wonderful watercolor. I have never seen a white trout lilly. That’s special. Dawn: Thank you! It’s never too late to start painting…no pressure! Northern Birder: I’m not sure how common they are in this area but I know we do have yellow ones too. Thanks so much for the nice comment!